Dr Maria Madge is a chiropractor based in Norfolk. 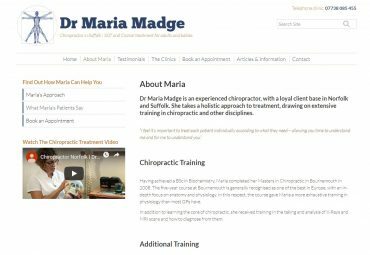 She needed a website to promote her business and advise patients on the process of joining her clinic. She wanted a no-nonsense website that would provide the relevant information to potential patients. The site needed to be SEO friendly and easy for an external SEO agency to update both content and SEO strategy. We designed a simple logo for the business since it had no visual branding in place. We extended the branding to have calm, restful colours – neutral beige and navy blue – that we used on the site. 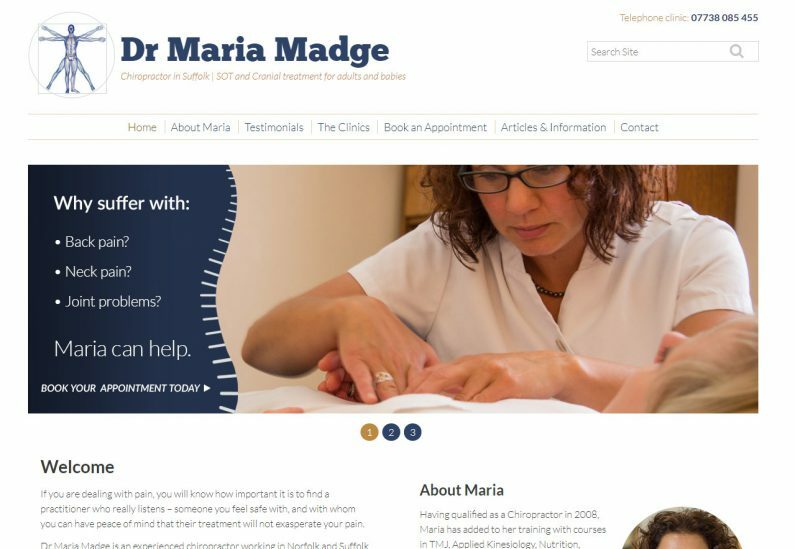 The spine graphic, an important part of Dr Maria Madge’s business identity, was incorporated into the home page image slider, along with some photographs of Maria treating a patient. All working to strengthen the business brand identity.